A scout's motto is "always be prepared" and, Parents, this overview helps do just that for your and your children dealing with an upcoming surgery. The article by is broken down by age group, providing suggestions appropriate for their age. The information provided allows parents a framework from which to help them determine how to best approach the topic with their child. 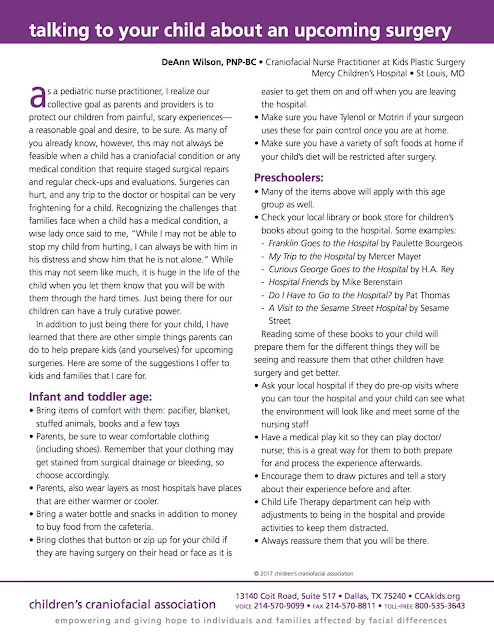 DeAnn Wilson, PNP-BC of Mercy Children's Hospital prepared this excellent overview for us. We are grateful for this resource we're able to share with you. Find it here online.